Tripp Lite's 1.83 m (6-ft.) daisy chain cable is designed to connect a B020 / B022 NetDirector KVM switch to another NetDirector KVM switch, allowing for the expansion of the number of computers/servers that can be controlled from a single keyboard, mouse and monitor. This premium cable features a PVC jacket and double shielding (foil and braid) for maximum EMI/RFI protection. The cable's DB25 connectors are molded with integral strain relief and easy-grip textured overmold. 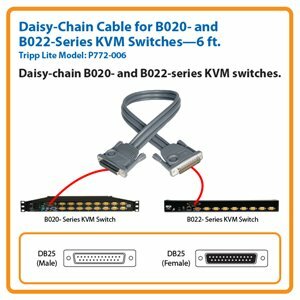 For use with Tripp Lite B020- and B022-Series NetDirector® KVM Switches, the P772-006 Daisy-Chain Cable connects multiple switches to increase the number of computers/servers that you can control from a single switch. This 6-ft. cable has a DB25 male connector on one end and a DB25 female connector on the other end. For peace of mind, the P772-006 comes backed by a lifetime product warranty and has an eco-friendly, RoHS-compliant design. The P772-006 provides the ability to connect your KVM switch to other KVM switches to multiply the number of computers/servers you can control from a single unit. It’s an easy way to double, triple or even further multiply your control. Made of top-quality materials, the P772-006 has gold-plated copper contacts for superior conductivity. Double-shielding with foil and braid provides maximum EMI/RFI protection and superior signal quality. The P772-006 also has molded connectors with a textured surface for easy gripping and integral strain-relief for durability and long life. A flexible PVC jacket makes this cable easy to install, even in tight corners and other space-restricted areas. The P772-006 comes backed by a lifetime product warranty and is manufactured in compliance with strict RoHS specifications, reflecting Tripp Lite’s commitment to environmental responsibility.